Links : Articles, Maps, etc. Casterton & Dist. Hist. Soc. Welcome to a local & family history website designed for the sharing of information on the early families who settled in the Glenelg and Wannon valleys of south-west Victoria, Australia. The search engine and links on the left of this page provide easy access to the contents of 1100+ pages. Links to : 1848 map : 1885 map. 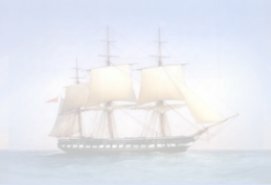 Information on early settlers, events, links & suggestions welcomed! European settlement of the Glenelg & Wannon region commenced in 1837 when the HENTY family moved north from Portland Bay and occupied the pastoral runs of "Merino Downs," "Muntham," "Sandford" and "Connell's Run." After settling in 1834 on the coast at Portland Bay, they had been unaware of the lush pastures to their north due to the barrier of thick forest, but in 1836, when the explorer Major Thomas MITCHELL travelled overland from NSW, and down the Glenelg river valley, he was surprised to find the HENTYs' Portland Bay settlement, and provided them with this valuable information. James SMEAD (1804-1882), an ex-convict from Van Diemen's Land & member of the original HENTY party that established "Merino Downs" in the Wannon valley in 1837, later involved in the occupation of Mount Gambier by the HENTY family in 1841. Surveyor Charles James TYERS 1806-1870 travelled the Portland Bay district to survey the N.S.W-S.A. border in 1839-40. The overland route to Adelaide from the Wannon was pioneered by Charles BONNEY 1813-1897 who camped with cattle at HENTY's station in March 1839, followed by Joseph HAWDON 1813-1871, owner of the cattle, who travelled in a tandem gig with Lt. MUNDY. The movement of settlers north from Portland Bay and west from Port Phillip and into the interior of south west Victoria from 1837 created many interactions with the local aboriginal population. An 1848 map of the Portland Bay hinterland from "Wando Vale" (ROBERTSON) in the north to Portland in the south and the SA border in the west to Branxholme (Kent's Inn) in the east, shows the inns, settlers and main tracks, and gives insight into the rate of settlement of the interior following the HENTY brothers in 1837. Many Heywood pioneers were teamsters, as Second River or Edgar's (Heywood) is where the track north from Portland branched in three directions. An 1885 map divided S-W Victoria into the counties of Lowan, Borung, Follett, Dundas, Normanby & Villiers. Many of the early settlers crossed from Van Diemen's Land, but some like Hugh McEACHERN & sons travelled overland from NSW with cattle & horses in the 1840s, before they settled at "Heathfield," west of Casterton. In his 1923 memoirs, J. C. HAMILTON (1836-1927) described his 1848 trip by bullock dray as a 12 year old, from "Bringalbert," near Apsley to Portland Bay on the coast. A different view was provided in 1857 by James BONWICK when describing his ride through S-W Victoria, while James MALLETT and Cuthbert FETHERSTONHAUGH recall life at "Muntham" in the 1840s & '50s. Rev. Dr. Francis Thomas Cusack RUSSELL 1823-1876 arrived in the Glenelg & Wannon district in 1850 and held the first service in the "Koroite Inn" in Coleraine. At this time the District of Wannon extended from Heywood in the south to the South Australian border and as far north as Chetwynd. It included Heywood, Digby, Merino, Henty, Sandford, Casterton, Chetwynd, Coleraine, Tahara, Balmoral, Hamilton, Branxholme and the surrounding districts. He resided at the "Parsonage on the Wannon" south of Coleraine from 1851 until he left for a trip home to Ireland in 1875, but died on the return voyage in 1876 and was buried at sea. The first resident Presbyterian clergyman at Coleraine & Casterton was Rev. William GRAHAM 1862-1866. Rev. William COPELAND, the border district Anglican minister, drowned in a "Benayeo" swamp near Apsley in 1862. One of the very early district inns was the "Woolpack Inn" at Digby, or Emu Creek as it was then known, was opened in 1843 by Richard LEWIS . Racecourse Road, off Shiels Terrace, Casterton. Mail : P.O. Box 48, Casterton, VIC 3311, Australia.